Purchased from Galerie Issa in Port-au-Prince c.1973. To current owner by descent. Excellent condition. Some natural cracking as shown in photos. Purchased from Galerie Issa in Port-au-Prince c.1973. To current owner by descent. Excellent condition. Purchased by current owner from Galerie Issa in 1971. Andre Dimanche in 1970's (photo courtesy of Robert Brictson). In Haiti, wood was mostly used to produce lacey fretwork and balusters, particularly at the turn of the century, in Gingerbread houses. Bas-relief motifs were also sculpted to ornate furniture. While still having a decorative function, in the 1950s, wood became an important material for the manufacture of household items. It also became a major material for sculptures. Haitian artists, particularly painters associated with the Centre d’art, had their work shown in the Fine Arts Pavilion of the 1949 exhibition celebrating the Bicentenary of the city of Port-au-Prince. Some have even participated in minor projects decorating, among other places the Pavillon of Tourism. These projects were celebrated for their excellence. It is in that context that an agricultural superintendent, also an amateur sculptor from the southern city of Jeremie, received an award for one of his pieces. His name: André V. Dimanche (1901-1988). 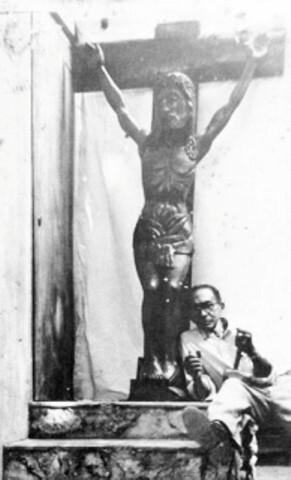 Dimanche’s introduction to the artistic community of Port- au Prince was supported by Albert Mangones, who later was celebrated for his sculpture "The Maroon Slave". Jason Seley, an American sculptor, then in residence at the Art Center, was also fascinated by the work of this modest man. We must remember that, at the time, talent scouts of the Centre d’art were discovering the aesthetic qualities of Haitian popular paintings, then coined primitive or naïve. 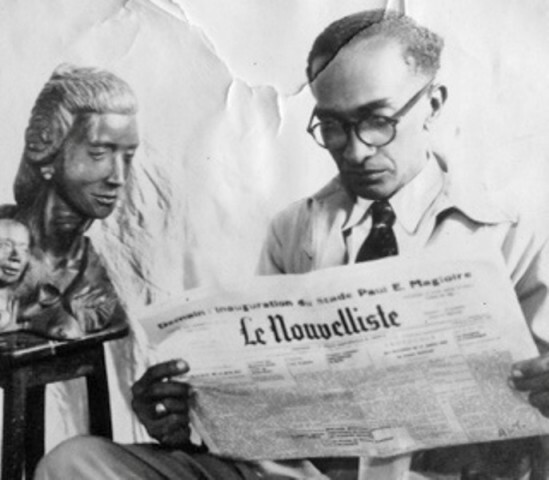 Sculptures carved by André V. Dimanche, who had only a short training in woodworking and carpentry, were a revelation. His creations were thus seen as part of what was, at the time, called the ''miracle". When he began sculpting, André V. Dimanche was in charge of a ficus plantation, these trees producing a milk like substance used to make rubber. He was thus all day out of the city, with a unique chance to contemplate nature. In terms worthy of a man from the city of poets (out of Jemerie came several great Haitian poets), Dimanche’s friend Numa Chassagne, wrote: "nature is a magnet for those who have an artistic soul, it liberates their latent feelings. Few can perceive its silent language for "They have the intuitive vision."" The idea of an "intuitive vision" is key in understanding the art of André V. Dimanche. Coming across "a tree broken by the wind, a branch of almond trees which, struck by lightning, was detached from the trunk" André V. Dimanche simply listened to the emotions, the feelings, the impressions and sensations that caused this encounter. This is the intuitive vision that, in the eyes of many, make artists appear to be original, even strange in their behavior. They accept what is intangible, inexplicable and mysterious. They have something that looks like a sixth sense. Eddy Cavé, in his book "Memoire d’un Jeremien", quotes Jean, the son of André V. Dimanche: ".. .to an American journalist who wanted to know how he works, André replied: "very simple! I take a tree trunk and I remove what is in excess"." It was his way of saying that he was simply guided by the original form suggested by the material: the root of a tree or one of its branches. He approached the section of a tree establishing with it a relationship that is both physical and sensual. Carving directly, he revealed the raw shapes. He did not seek to repress the material but to highlight the beauty that it suggests. The result is that, of these pieces of wood, figures of a stunning presence are revealed. Oddly, there was little interest in his intuitive vision. Less concerned by the "what", critics tried to understand the "how". In various texts that deal with his work, one can find a detailed inventory of the tools that he used: a knife, a machete, a razor blade, a little hammer, brushes, and sponges. Instead of focusing on the tools, they could have concentrated on this magic, this sensitivity that emerged and still emerges from his sculptures. 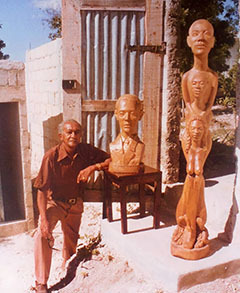 Deciding to make sculpture a professional career, André V Dimanche moved to Port-au-Prince. He had the good fortune to find patrons who supported him. Grateful for this opportunity, he offered in turn advice and training to young people who wanted to follow his footsteps. Although by living in the capital city he no longer had access to the forest, the material was readily available. He sculpted more than he ever did preferring making sometimes larger pieces. Approaching the material with secure and measured movements his sculptures slowly came to be. This process often took a month or more. Collectors who, from abroad, had commissioned works were told that they had to wait. Moving to the city made Dimanche open to various influences. In his sculptures, changes were noticeable in both form and content. His sculptures therefore did not escape the modernist atmosphere that prevailed in the time. In various projects he expressed his passion for the human body. Forms were stretched, at times coming close to images of artists like Modigliani. The truth is that being self-taught, Dimanche, never felt constraint to comply to academic rules of the anatomy. He was all the more free that the material, more block like, he had access to had ceased to impose its forms. Without abandoning the folklore as a source of inspiration, he began exploring other themes. He expressed a certain revolt in a work like "negritude". I personally knew some of his works commissioned by a religion congregation for its chapels at the St. Martial College. It may seem trivial today, but it’s important to know that at the time, this was quite extraordinary since it was a commission from a Catholic institution to an artist who has made images of voodoo deities: Baron Samedi, Erzulie and Damballah. Although André V. Dimanche had limited support from the Haitian government, he had to fight a daily battle against all kinds of difficulties. Fortunately, he was a man who, like the philosopher and Norwegian ecologist Arne Naess, thought that "if anything can happen, there is reason to hope". He was a sensitive, courageous and optimistic individual who is remembered with pride by his children and who, in our collective memory, must find his place.